Oh. I have no idea what that is! Maybe smudge tool could achieve a similar effect. But for great fun, mess around with the regular Gimp text tool. Changing sizes, fonts and baseline. Not difficult, look at the threads Blighty referenced. Require more details, ask in the General Questions section. 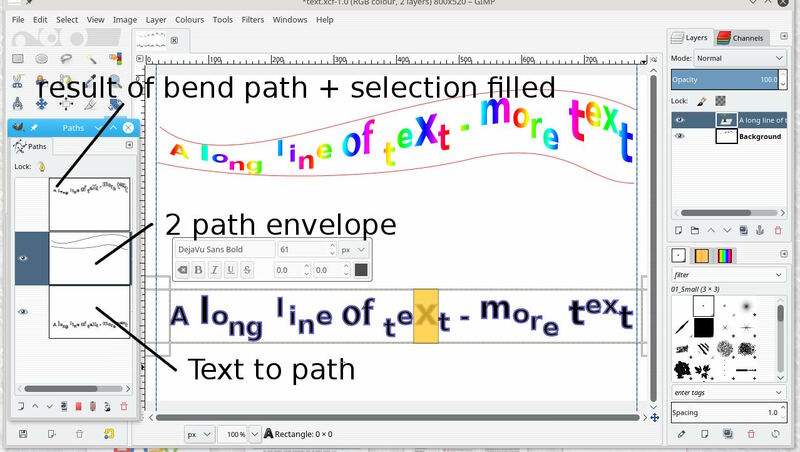 Most bitmap-based tools make the text too blurry. To avoid this you work on the path which is the outline of the text and once that is distorted/warped/bent, you render the text from it, so the resulting distorted/warped/bent text is exactly as sharp as the initial text. (02-08-2018, 01:00 PM)Ofnuts Wrote: Most bitmap-based tools make the text too blurry. Which is why I said "bitmap-based". When the text is a bitmap, any change in the text involves interpolating pixels, which makes the text blurry. Current time: 04-21-2019, 08:44 PM Powered By MyBB, © 2002-2019 MyBB Group.